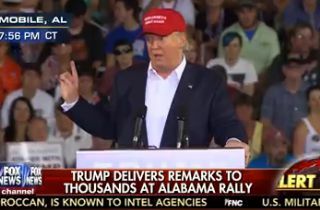 Donald Trump‘s campaign speech in Mobile addressed all the usual topics: from the importance of stopping illegal immigration, to blaming China and Mexico for sucking America dry. Most of the night’s talking points recapped what he’s already said on the trail, but he did have at least one new target in his quest for American greatness: Nabisco. The company that gave us Oreos and Chips Ahoy! recently told the Chicago Tribune that after lay-offs and an opt-out of a factory upgrade deal, the bakery company would be constructing its new plant in Mexico. Trump evidently heard about this, and brought it up in his speech while discussing how China has undercut the business economy and Mexico seeks to do the same. From there, Trump said that it was all part of the sad economic trend, comparing the situation to Ford’s decision to build car factories down south.